No Exit will be ushering in their tenth season with a concert at SPACES. 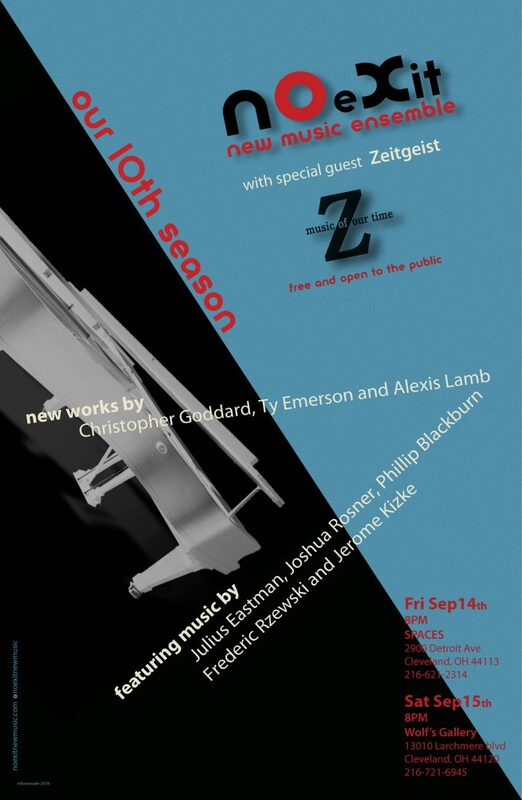 Joining No Exit will be the ensemble’s favorite coconspirators, the incomparable Zeitgeist (from St.Paul, Minnesota). The program will feature brand new world premiere works by Christopher Goddard and Ty Emerson along with music by Joshua Rosner, Philip Blackburn, Jerome Kitzke and a structured improvisation for both ensembles to perform together by Julius Eastman. This is going to be an extraordinary season of music and it all starts here! Free and open to the public.